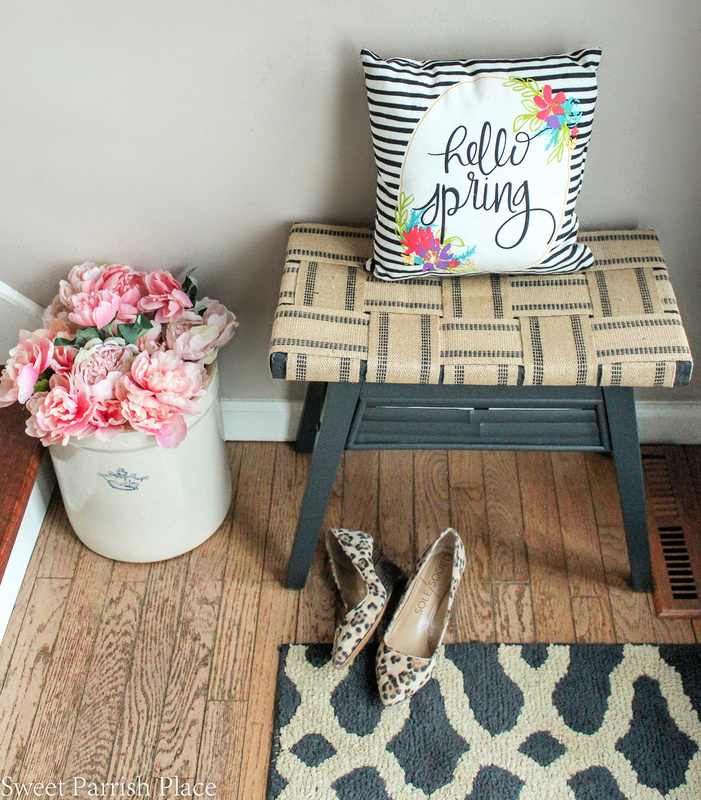 This DIY bench makeover is part of a series on Sweet Parrish Place called Trashtastic Treasures, see how I took this beat up old bench and made it look brand new! Hey friends! 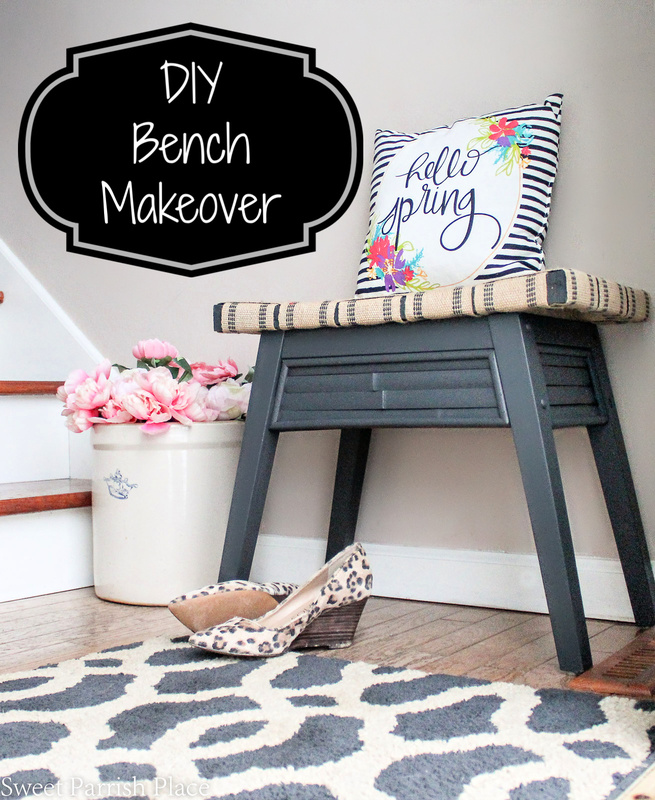 I’m so excited to be sharing this DIY bench makeover with you guys today, I love the way it turned out so much. 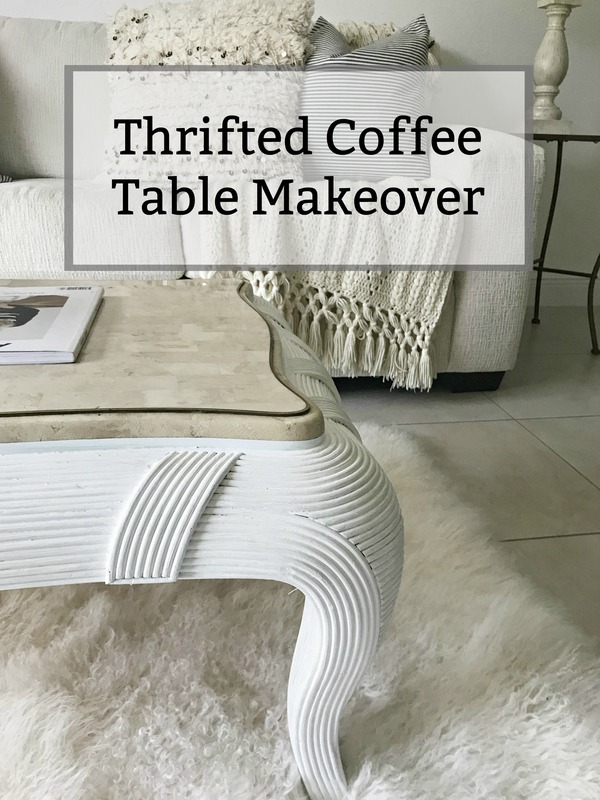 I love the whole idea of taking something you already own, or something you find at a thrift store or yard sale, and giving it a whole new life. 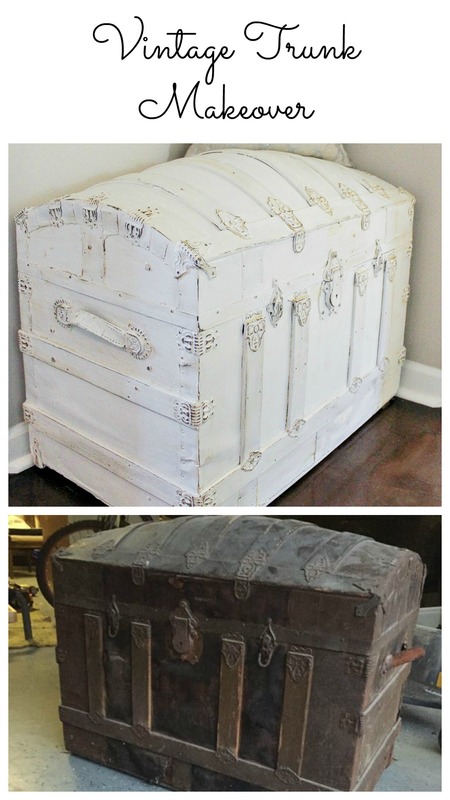 I think it is not only great for the environment to repurpose or upcycle things, but it is also great for your budget! I have owned this bench for 6-7 years. 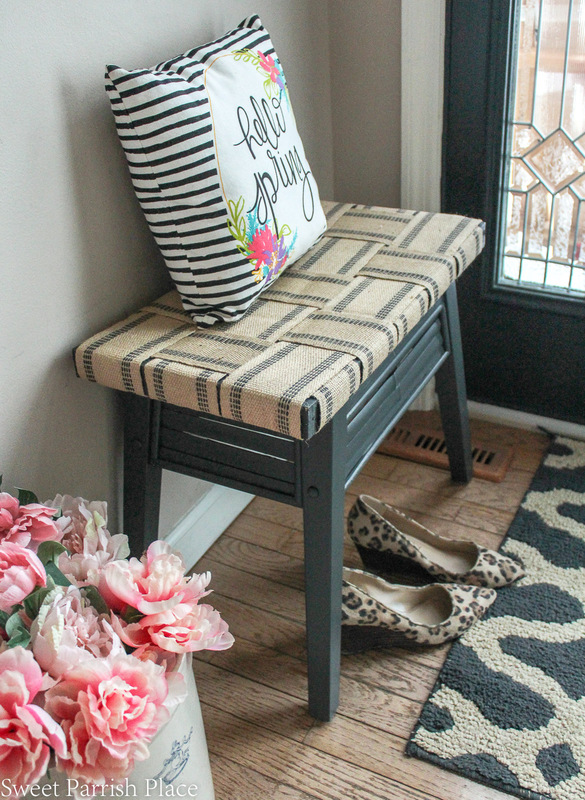 I bought it at Marshall’s to use as a little bench right next to our front door in our split level entryway. It was just the right size to fit into this very tight space. The bench isn’t really used to sit on, it is used more as a spot to drop things like mail or packages that we need to take to the post office, and most of the time in holds a basket that holds things like out dog’s leash and poo bags and dog treats. Let me show you what the bench looked like before I gave it this little makeover. If you look at the before photo below, pay particular attention to the left corner, and you can see that our dog had chewed right through the rattan. He has actually grown out of chewing on things like furniture (but he stills chews on pillows and blankets, ugh!) But I had never gotten around to doing anything about this sad looking little bench. 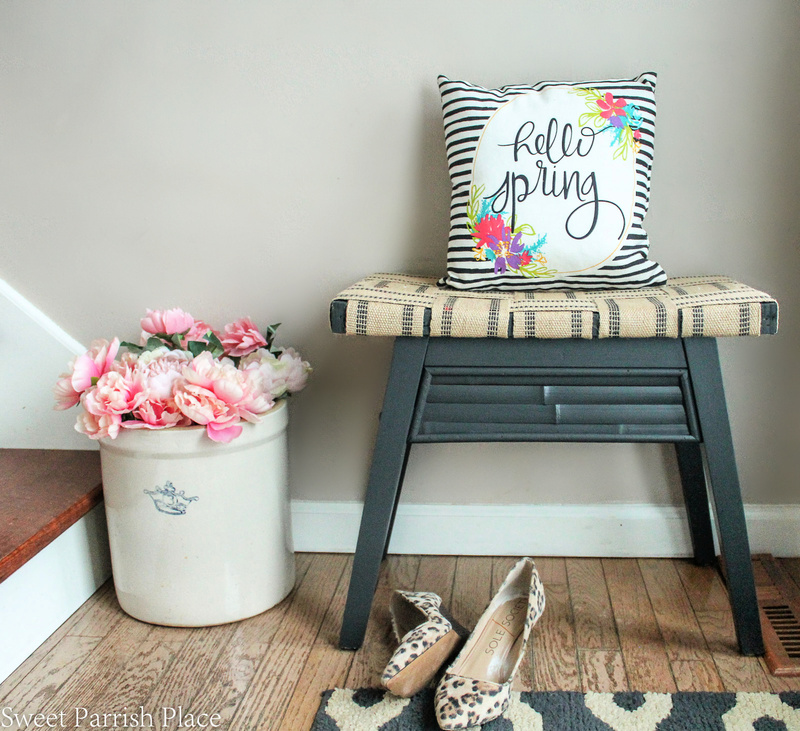 I had it in the back of my mind that I needed to either replace this bench altogether, or give it a makeover, and I found the perfect opportunity when I was contacted by a rep for a website called BurlapFabric.com. She offered for me to choose some items from their website to use for an upcoming project. 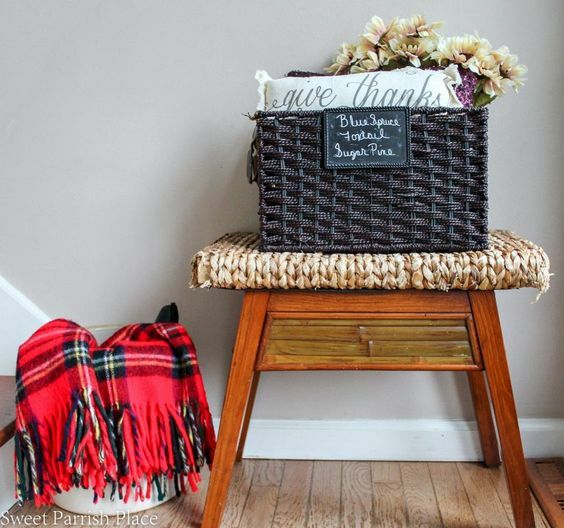 I found this jute webbing you see below, and it occurred to me that I could use it to do a makeover on this bench! So I ordered some of it. 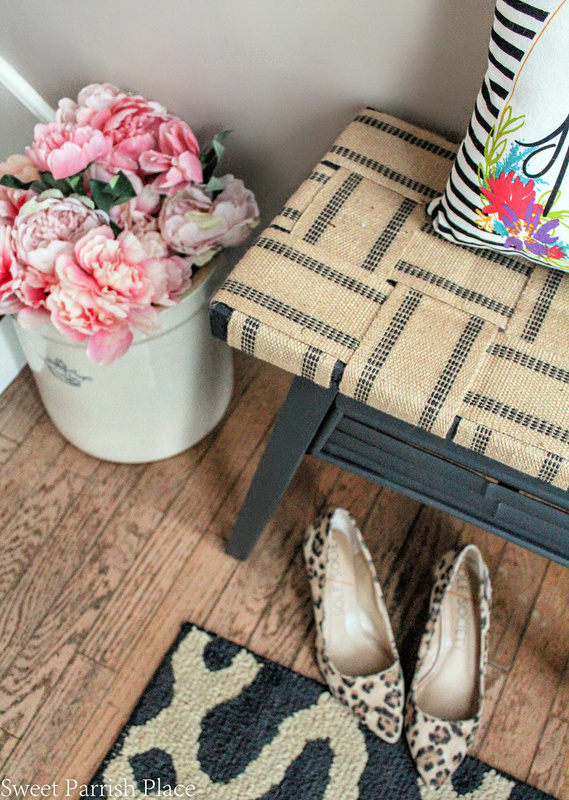 Please read below to see how I did the jute webbing and made this bench look brand new. I started this makeover by removing the old top from the bench with a screwdriver. Once I had the top removed, I cut all of the old rattan off of the frame. If you look at the photo below, that is the frame after I removed the rattan. Removing that stuff was very messy, but nothing a good vacuum couldn’t fix. The rattan had been stapled onto the frame, so I also removed all of the old staples using a pair of pliers. After that was removed and cleaned up, I lightly sanded the bench to scuff it up. I was not trying to completely remove the finish, just trying to rough it up to give the new paint something to grab onto. After I was finished sanding the bench, I wiped it down with a damp rag and let it dry. Once the paint was dry I gave it two coats of the black paint, which is Iron Ore by Sherwin Williams. I happened to have a sample pot of this color that a friend had given me, so I wanted to use something I had on hand. The goal was to not have to purchase anything to complete this makeover. And I received the jute webbing for free, but it would have only cost me less than $10, even if I had purchased it. I also painted the frame of the top of the bench, as you can see in the below photo. I knew some of it would be showing through, and so it needed to be painted. I started by placing the jute webbing to span the width of the bench. 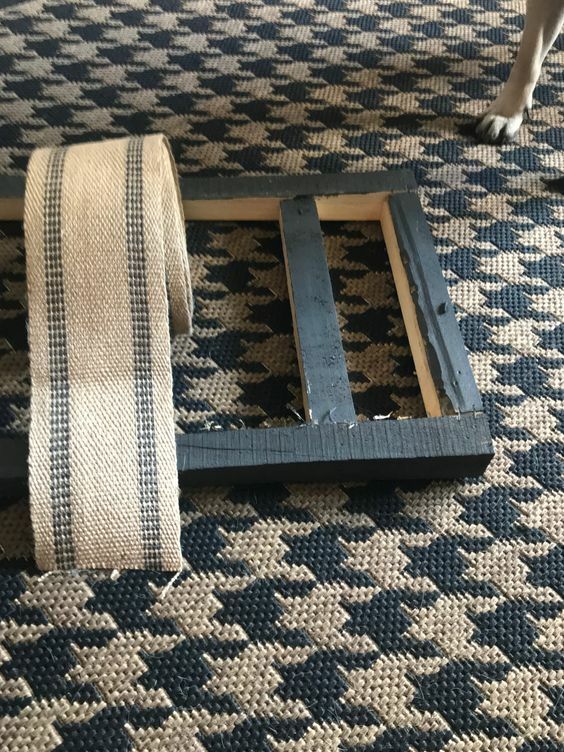 I took my frame and wrapped the jute around it so that it wrapped nicely underneath each side and had enough of the fabric to staple to the bottom, and then I cut three strips in that same length. I used a pencil to mark the fabric on the first piece I cut, and then I just used that piece as a template to cut the other two pieces. I only needed three pieces to cover the entire width of the bench. If you are doing this on your own bench, you will need to determine how many pieces you need based on the width of yours. I began by stapling the piece in the middle. 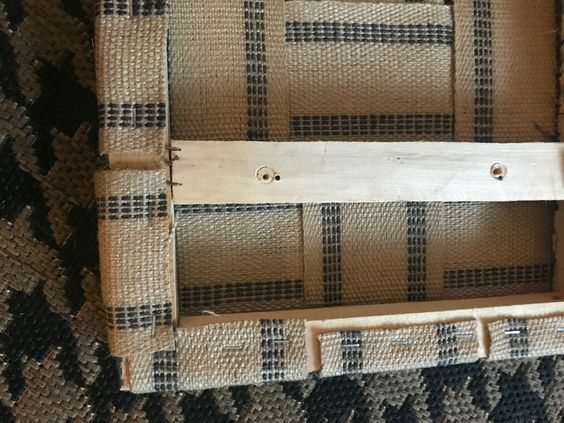 I just turned the frame over to the back and stapled down one edge of the jute webbing. I then turned it right side up and made sure it was straight and pulled taut. Then I flipped it back over and stapled down the other edge while making sure I was pulling the jute webbing as tightly as possible. After the middle piece was in secured in place, I did the other two pieces. Next, it was time to weave the jute webbing sort of like a basket pattern from front to back. You can see in the picture below I had weaved it all before I stapled anything down. That is why it looks loose. I needed 5 strips of the jute webbing to cover my bench. The amount you need may vary depending on your bench. 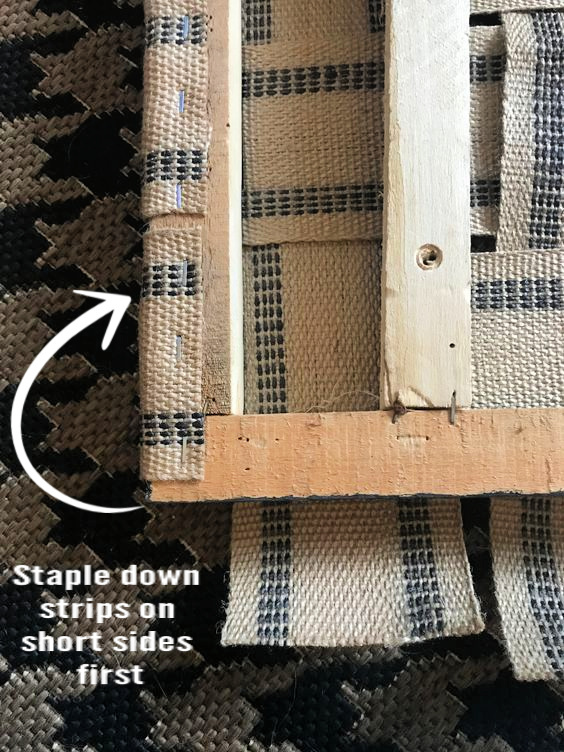 Remember, the pieces going from side to side are already tightly stapled at this point, so you can use them as a guide to weave your webbing, alternating by going over and under. 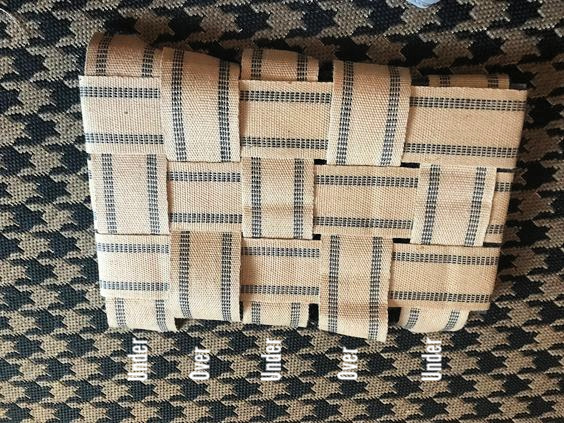 I have added a caption to the photo below to help you understand how I did the basket weave pattern. You will do one piece starting going under the webbing, and then the next piece will start by going over, and so on and so on. I would recommend that you don’t staple any of the pieces until you have them placed where you want them. I learned this the hard way, and had to remove several staples before I got it the way I wanted it. You want to make sure they are spaced out evenly to go across the bench. When I had all of the pieces weaved in and out the way I wanted them to look and spaced evenly, it was time to begin stapling each piece down. Again, I started with the middle strip and worked my way out on each side. Making sure all the while that I had each piece even and where it should to look symmetrical. Make sure you are pulling everything nice and tight before you staple things down. I did flip the bench over several times, to double check that things were spaced evenly and straight, as I was stapling. Here is a look at the under side of the bench after I was finished stapling it. And voila, it is finished and it looks lovely back in it’s original spot next to our front door. Here are some photos I took to prove it! The floor on this landing needs some attention. It is very faded from years of sunlight shining onto it. I am hoping to address it at some point. Or should I embrace the imperfection and leave it alone? Which is what I have been doing for the past 6 years, ha! I have to say, I appreciate the subtle details of the base of this bench much more now that it is painted. the original color was way to orangey for me. I also want to mention that we do not sit on this bench. We never have. it is placed in this spot as a landing place to sit things, not as seating. So I am not sure whether this would hold the weight of a person sitting on it or not. I am thinking it would, because this jute webbing is used in upholstering furniture. But if I were planning to sit on it, I would have probably reinforced the under side with a piece of wood or something as well. I love it when I can spend a very small amount of money and change up something I already own, don’t you? 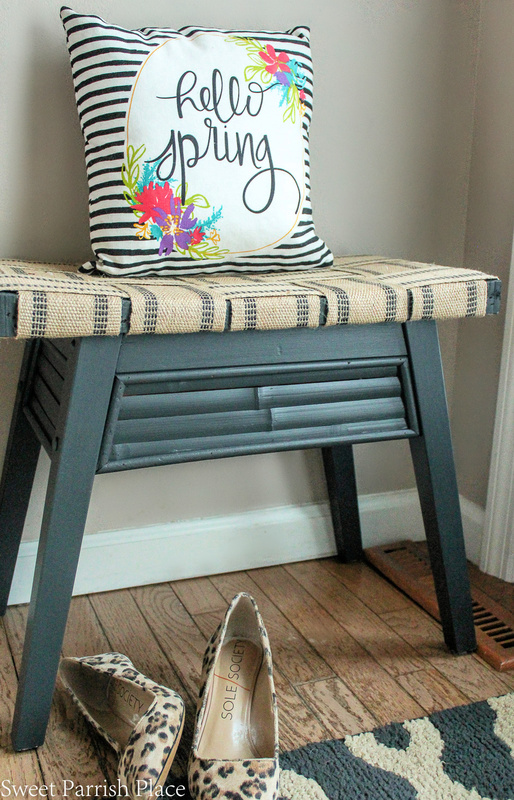 I am so happy I was able to salvage this little bench because it fits perfectly in this spot. 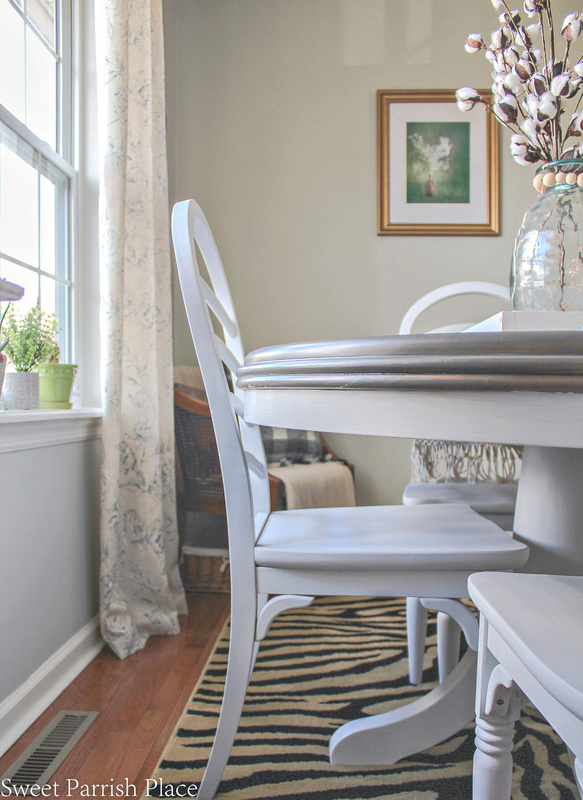 I have a spring home tour coming up, so you are getting a little sneak peek at our entry today. 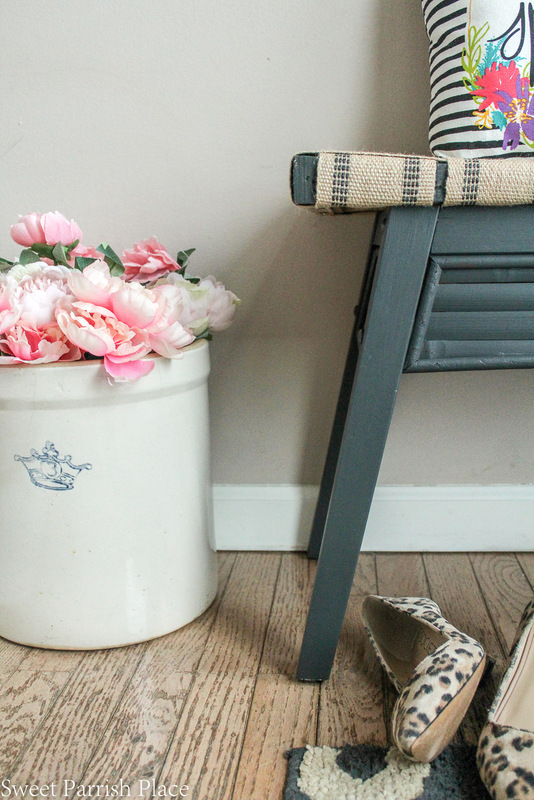 I love my vintage crock filled with spring peonies. My ex mother-in-law gifted me with two of these crocks in the same size and I love them both. 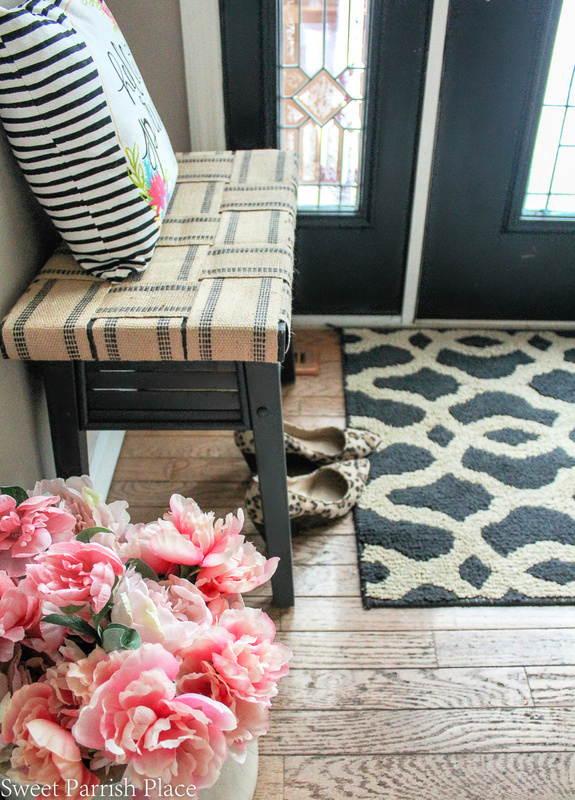 You can see in this shot below that our front door is a charcoal color and the bench coordinates well with it. I love the way the jute webbing turned out on the bench! It brings in a natural farmhouse element. I bet you I could sell this little bench for more than I paid for it! 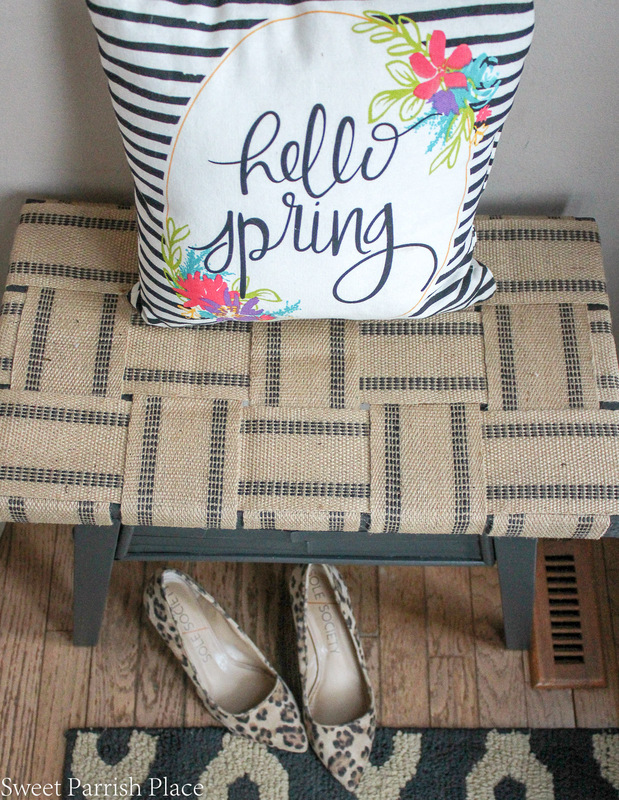 I hope you enjoyed this DIY bench makeover addition to my Trashtastic Treasures series, and please stay tuned for a Spring Home Tour that will be coming to the blog soon! Thanks for popping by today. 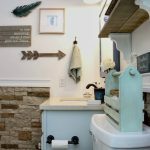 Do you have any questions about this little DIY project that I didn’t make clear in this post? If so, just ask away in the comments below and I will be sure to respond.